What a month! 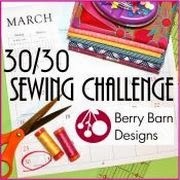 It was a great idea to join the 30/30 Challenge hosted by Berry Barn Designs. It encouraged me to quilt as often as possible and I got to read some great blogs, comments etc. Thank you everyone, especially Sarah of Berry Barn Designs! I will also be working on my frog quilt. My objective is to get the quilt top finished. What was I thinking? I think I thought I was going to take the month off work and quilt! The Quilt-Along project is almost finished. I used only Dot-to-Dot FMQ on it. 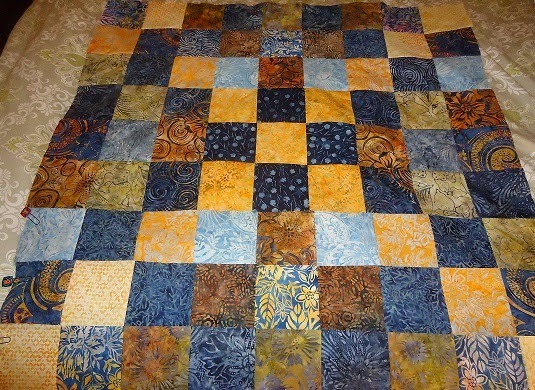 All of the blocks and the sashing have been quilted. I just need to quilt the border with the Cathedral curves. I completed two blocks of the frog quilt in the first week of the challenge. That's as far as it went. The Grandmother's Choice quilt is coming along. Before the challenge, I had chosen and cut the fabric for 5 more blocks. This weekend, I completed them, plus one more; and then chose the fabric for another 6 blocks. I haven't blogged about them yet but I will in the near future. I attended one quilt guild meeting and three classes in Canadian art appreciation. One of the reasons I got so much done was that I went on a quilting retreat from Thursday to Sunday this week. That's essentially where I did everything that I hadn't done in the previous 3 weeks. Why am I always so ambitious in setting goals? At the time, I actually thought they were pretty realistic. Not sure on which planet or alternate universe! I really did get a lot done - frankly an incredible amount. It just wasn't on the projects that I had anticipated doing. In hindsight my objectives were made up of projects that demanded a fair amount of concentration and focus. What I did accomplish included easier projects that I could do without too much thought. I had a wonderful time last Saturday at the Happy Villages course. It was taught by Jan Kittle, owner of The PickleDish quilt store in Carleton Place ON. 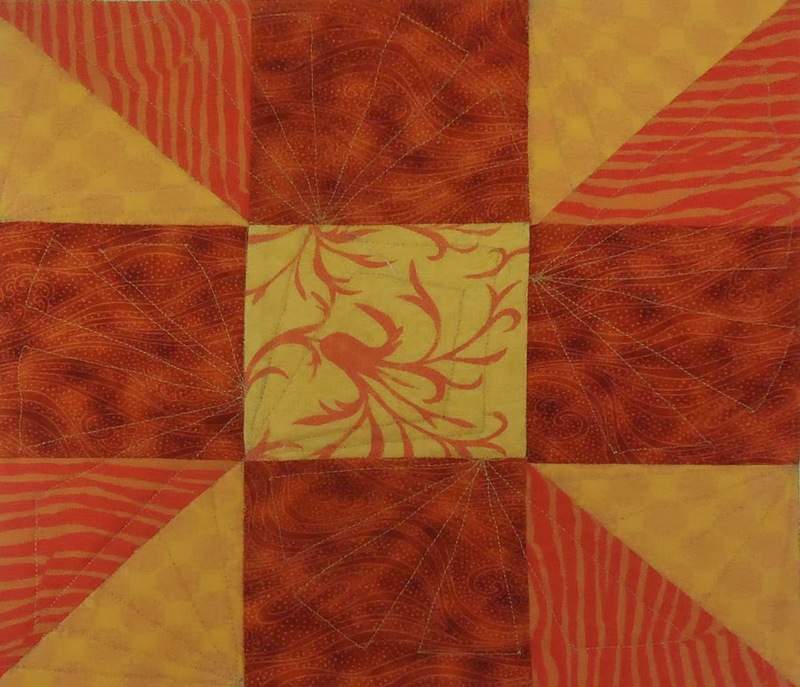 I used Jan's batiks as well as some of my own to create the quilt. 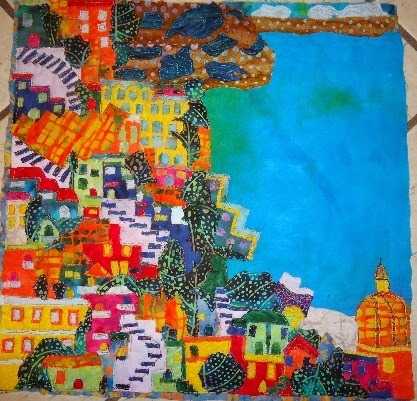 I based my Happy Village on a postcard that I bought on the Amalfi Coast in Italy two years ago. It was such a magical area that it would be great to have a quilt to commemorate it. This is the postcard that inspired the quilt. This is what it looked like at 3 pm on Saturday. It had a semblance of a village by then. This is what the project looked like by Wednesday evening. Since I left it on the dining room table, I was able to work at it in small chunks of time. I found that it was important to work on it and then leave it for a while to get the overall look of it. 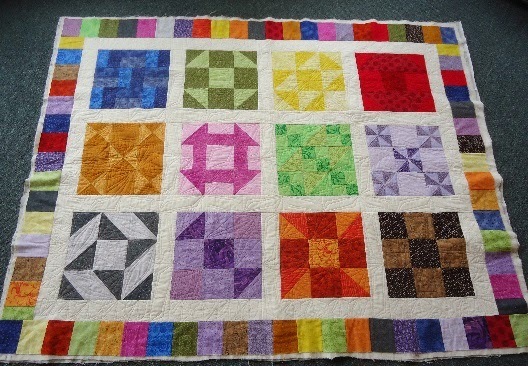 I'm really hoping that the free motion quilting (FMQ) will add a lot to it. I can't wait to give the church some details. 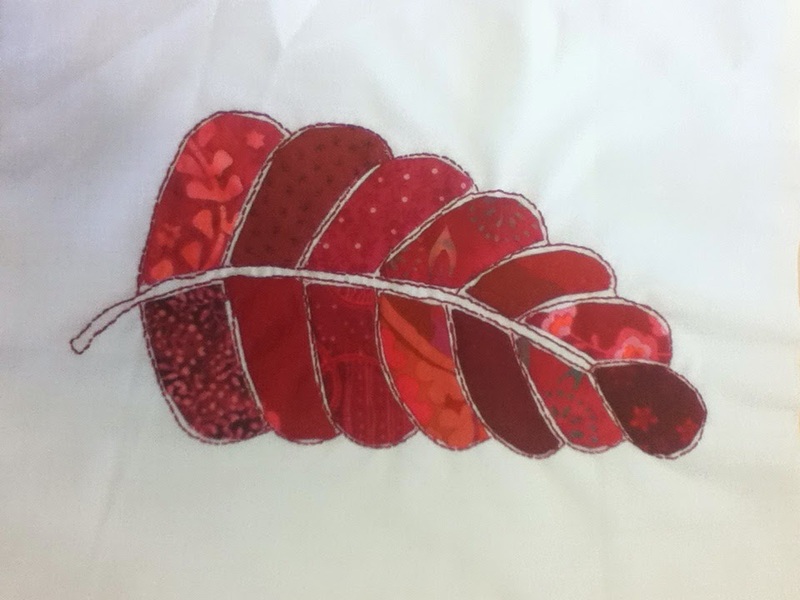 During the week I was able to do a little bit of embroidery of my second leaf. I also go the chance to moved the squares that were in the wrong place on my batik quilt. It's a VERY finicky project. Those tiny pieces are tiny! You cut the pieces, audition them and when you like what you have, you glue them to the surface. It's a very forgiving project. If you don't like what you put down, you just cover it up! It's not worth fighting with the glue to remove pieces. Since there's so much going on, I wanted to make sure that there was some consistency in the fabrics I used. I used the same fabric for all of the trees within the village, all of my stairs were made with the same background fabric (a light mauve-pink) with the stairs a dark blue. I also had some awesome orange-yellow fabric that I used for stone walls (and the top of the church since it was made of stone). Leaving it out and having it accessible to work on for short periods of time was the best way to go. I could spend a half hour or an hour playing without getting frustrated or too stiff. The week has been a very busy one. I did have a chance to spend some quality "me" time but it wasn't necessarily spent quilting or sewing. On Sunday, I finally got around to sewing my daughter a DIY Kimono from a lovely scarf. It came out ok, if you don't examine it too closely :-) When I finished it, I told myself that I wouldn't make another one, but since then I've been thinking that if I were to sew the front and collar by hand, it might be less trouble and look better. Here's the post. On Monday, I was so tired after work that there was no way I was going to be able to do any type of difficult blocks or FMQ. So, I found some lovely 5 inch Tonga batik mini squares in my stash. Since they were a great price, I had bought 3 packages. That was a great idea. Now I have enough to make at least a throw. The colours are beautiful - from dark blue, to pale blue, yellows and oranges. It's very rich looking. I've worked on it for a couple of days. Here is the result to date. Once again, it's taken a photo of my project to see that I've made an error - it looks like I've messed up the pattern of the yellow squares in the top left corner. I guess I'll have to fix that up. It's amazing how you "see" so much better when looking at a photo instead of the real thing! On Tuesday I went to the Common Thread Quilt Guild meeting. The presenter did a trunk show - she had some amazing pieces. When I went to look at her work up close during the break, I realised that I was able to recognize the FMQ that she had done. That's the first time it's happened to me. That's a sign that I'm learning my patterns. I was quite happy. On Thursday, I went to my second class - I'm taking a Canadian art appreciation course. 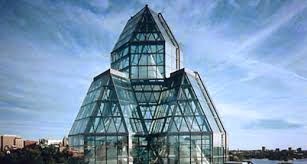 It's held at the National Gallery of Canada. What an amazing adventure. I get to look at great Canadian paintings in an amazing building while listening to our extremely knowledgeable and interesting professor - and the bonus... no homework. What a joy! In last week's post, I realised that if I wanted to sew every day, I should probably bring a small embroidery project to work so that I could do my half hour during my lunch break. I brought my project to the office and I worked on it for the first time today. This is a project that I started a couple of years ago. 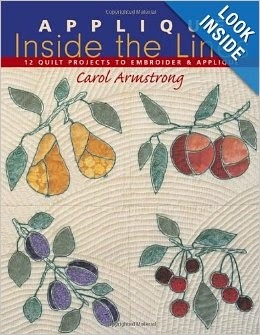 It's from the book Applique Inside the Lines by Carol Armstrong. I've done a couple of projects previously (here they are). This one is a set of three leaves. I've finished the red leaf and started working on the yellow and orange leaf. 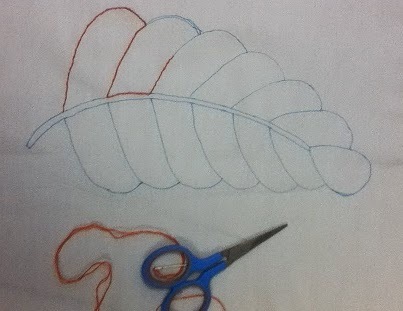 You start by embroidering the outline and then appliqueing the fabric within the lines. These are great projects for learning to hand applique. Tomorrow I'm going to take a quilting class offered by our Guild. We are making our own Happy Village, based on the book Happy Villages by Karen Eckmeier. This should be a lot of fun. 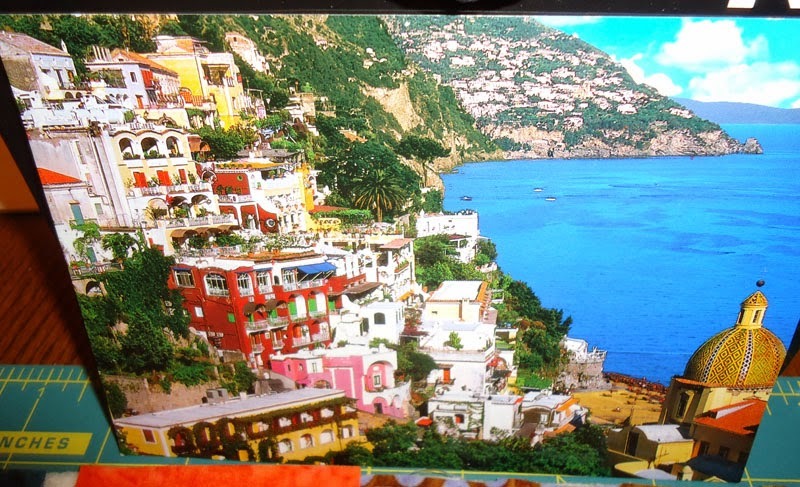 I'm bringing a postcard of the Almafi Coast in Italy. It looks a lot like some of the villages. Hopefully it won't be too difficult to make it look a little like it. It was such a wonderful area and we had a great time. 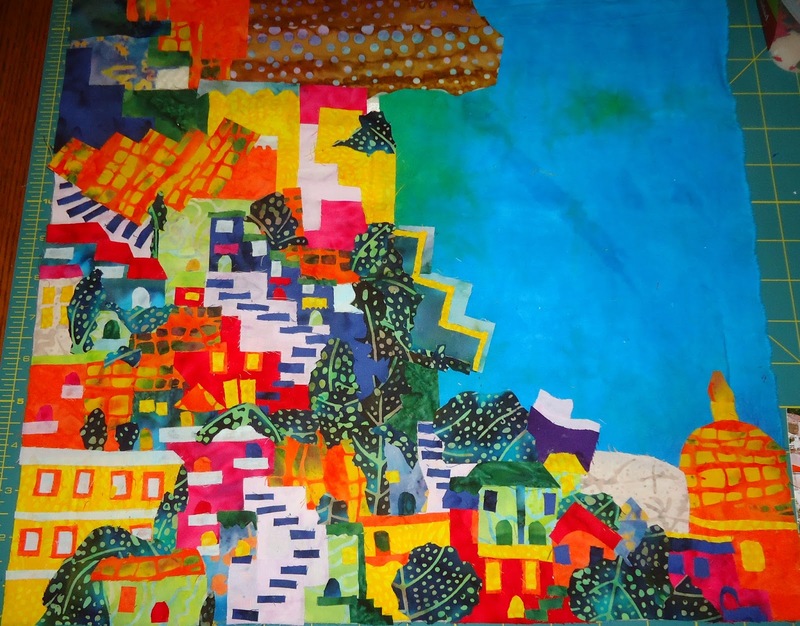 It would be fun to remember our trip through a quilt. Sometimes I feel bad that I have so many projects on the go but then I'm very grateful when I can choose to work on the project I want, based on my energy level. I guess it's not such a bad thing. At least I do get back to most of them....eventually. I didn't think I had accomplished much this week, but as I was writing my post, I realise that I've been productive. I may not have worked on my challenge projects, but I did have a good week! My daughter loves to watch YouTube videos - makeup, fashion, book reviews, etc. 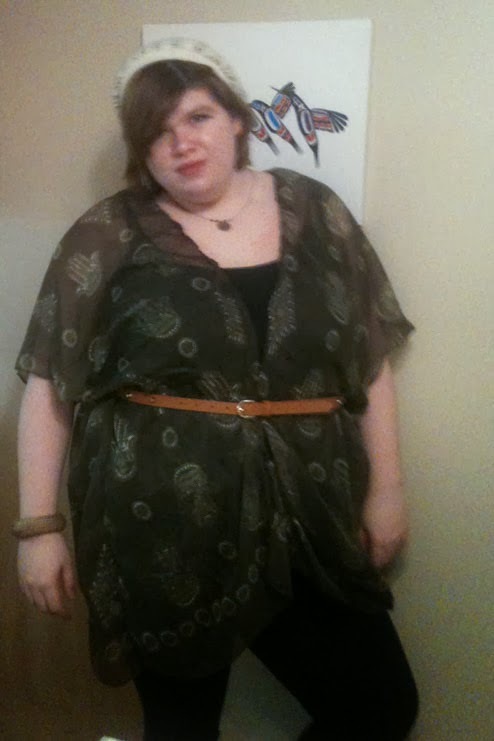 She asked me a few weeks ago if I could help her (aka sew for her) a kimono made from a scarf. Here's the link to DIY: Easy Kimono. She then bought a lovely scarf to use for the project. This is the result. It looks pretty good if you don't examine it too closely. The fabric was extremely flimsy. I was probably using the wrong needle. Anyway the inside seams are fine but the collar and front seams are pretty bunched up, but as I said, it doesn't look bad - it could be called a design element! It was a great idea to do a first attempt. I suspected that the fabric would be too stiff. It did give me a chance to see that the neck area would have to be adjusted a little bit to fit properly, even with a flimsy fabric. 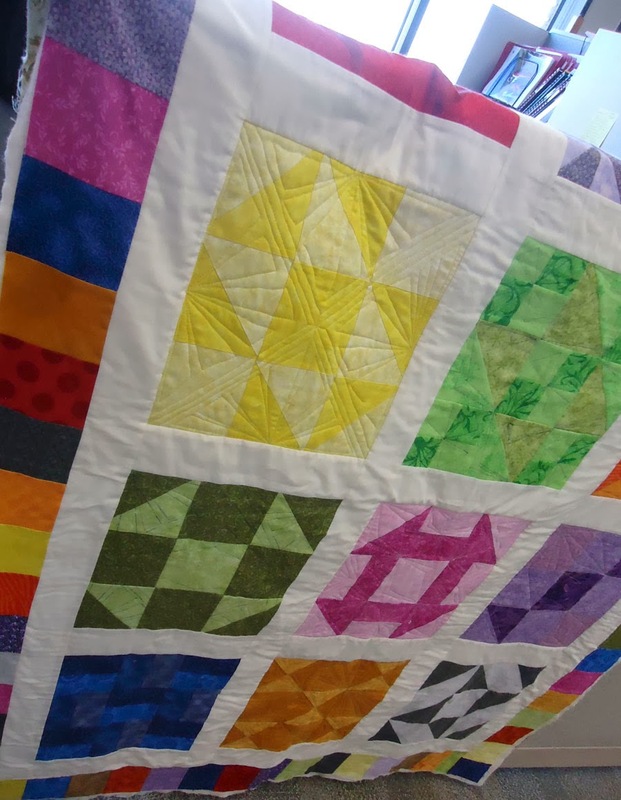 I did a lot of free motion quilting this week. Most days it was longer than 30 minutes - and only on one day, where I had things to do in the evening, did I not quilt or sew. For next week, I plan to bring an appliqué project to work so that I can appliqué during my lunch on the days that I have no sewing time in the evening. 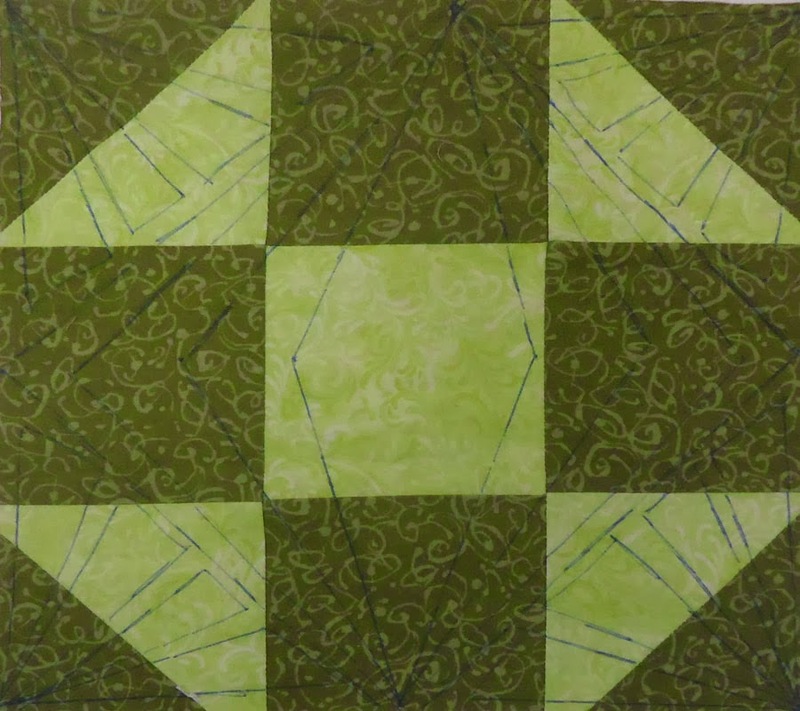 My free motion quilting (FMQ) did improve with daily practice, until I got over confident and started making mistakes. I love free motion quilting but it requires a lot of concentration. It's a great way to improve those "mindfulness" muscles! 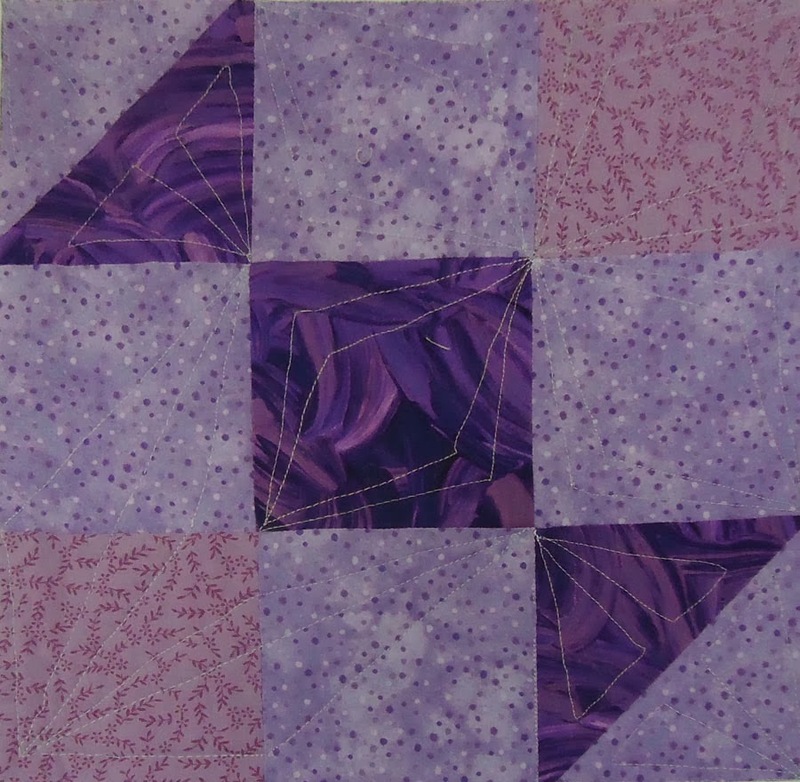 I was able to FMQ the three blocks that I had marked in my Quilt-Along Project as well as the final four blocks. Then I'll be starting on the sashing and border. That will probably take me longer to quilt than all of the blocks put together. There are a lot of "piano keys" along that border! If I don't get too cocky, I could be pretty good by the end of this quilt. I also completed two more blocks from my Frog Work quilt. I had a lot of problems with these blocks - I think that it's from cutting and piecing when I'm too tired. Considering the amount of re-doing I did, the blocks came out well. One of the great by-products of joining the challenge is getting to read everyone else's posts. It's so enjoyable finding ideas and tips on the internet. Quilters are so generous with their ideas and their learning. Overconfidence leads to mistakes - humility and mindfulness are key! To actually quilt or sew 30 minutes a day requires some planning - like having a project to pick up at lunch time when the evening isn't available. I do have to be careful what I sew when I'm tired. Re-doing blocks is not at all fun or efficient! 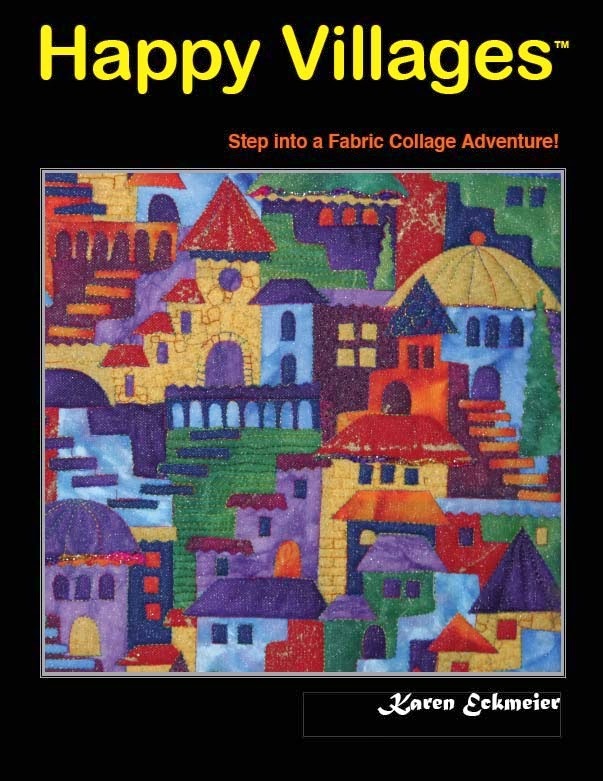 I love joining challenges that help me complete projects and not make me start more :-) The 30/30 Sewing Challenge is hosted by Berry Barn Designs. For the month of March (30 days) we have to spend 30 minutes per day sewing, quilting etc. Today may be March 4th, but I've been spending at least that much time quilting for the last 3 days. I'm sure that I'll get other odds and ends done, but I think that this is ambitious enough. The other great thing is we'll be reporting on our progress and getting to see everyone else's blogs. It'll be a blast. I'll include the link to the weekly accomplishments page so that you can have a look at the other participants' projects. 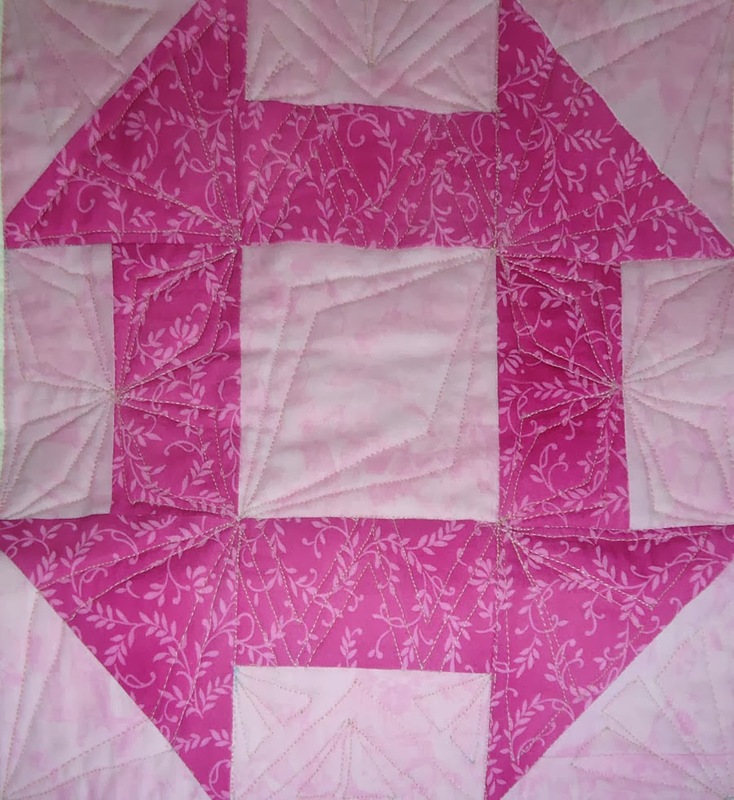 Looking back at my blogs, I realised that I started the Beginners' Quilt-Along well over a year and a half ago. Time sure does fly! My last post was in August 2012. By then, I had eleven of the blocks made. 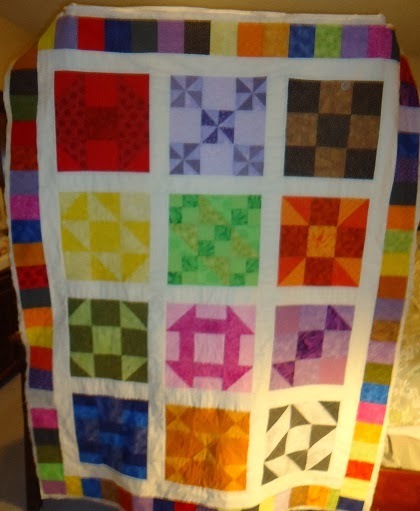 The entire quilt was made of 13 squares. I thought I would use an on-point layout, but changed my mind, so I ended up using only 12 squares. I discarded the black and white square, since technically they are not the same colour. All of the other squares are monochromatic. I was a lot of fun finding (and buying) the fabrics. Thank goodness for fat quarters! 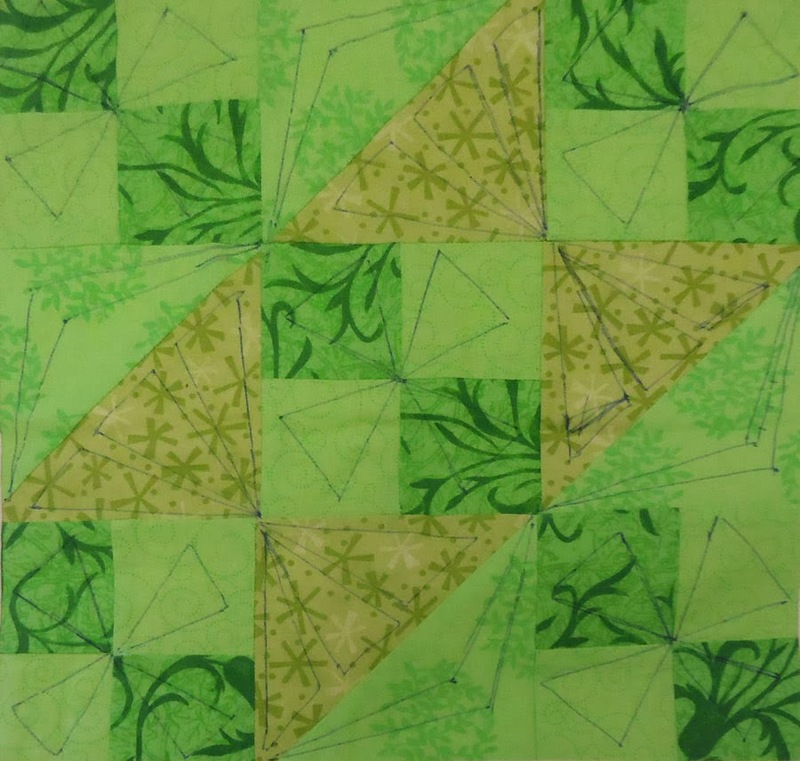 I think I put the squares together in the winter of 2013 during a guild quilting retreat. I remember making the piano keys for the border. I really like how it worked out. 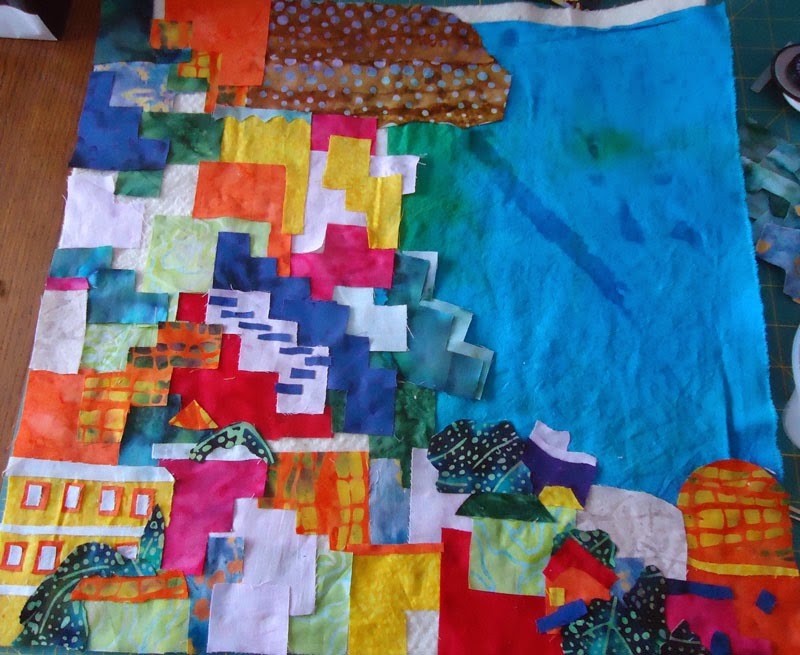 Here's a partial view of the quilt-in-progress. I wanted to wait to quilt this until I was able to do some free-motion quilting. Since I now have more experience and have learned various free motion techniques, it's time to practice on my Beginners' Quilt-Along quilt. The technique I decided to use is called Dot-to-Dot quilting with Angela Walters through Craftsy. I've really enjoyed Angela's class. 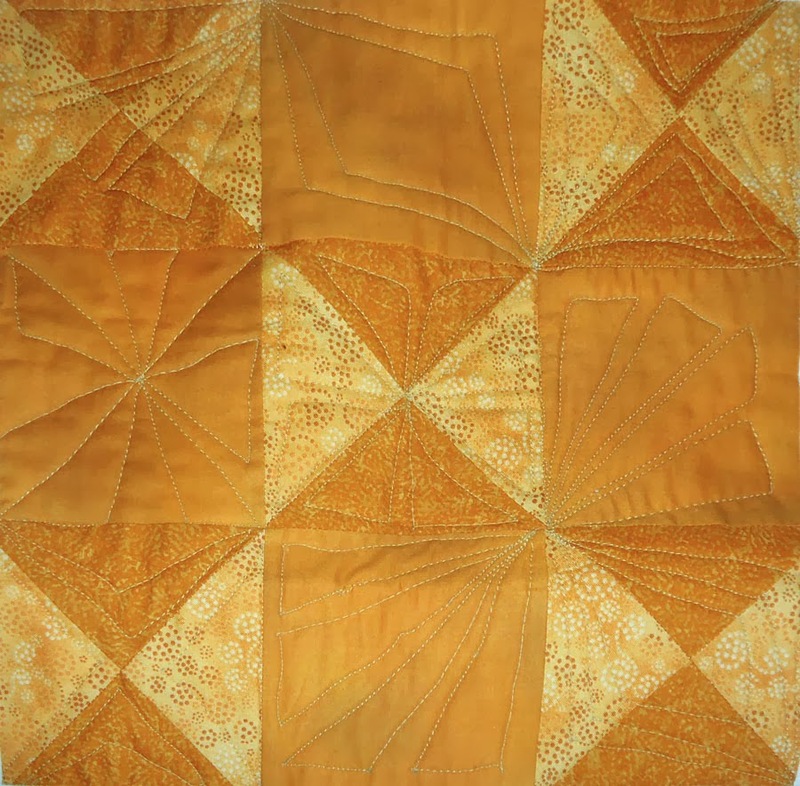 There are three main quilting patterns and then tons of variations that you can create. I now have 5 of the blocks quilted and 3 of them marked, ready for quilting. 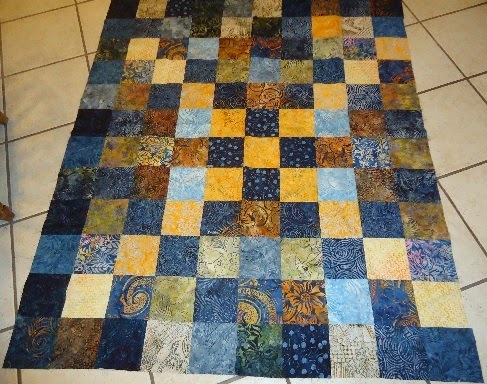 That leaves 4 more blocks after that, plus the sashing and the piano keys border. 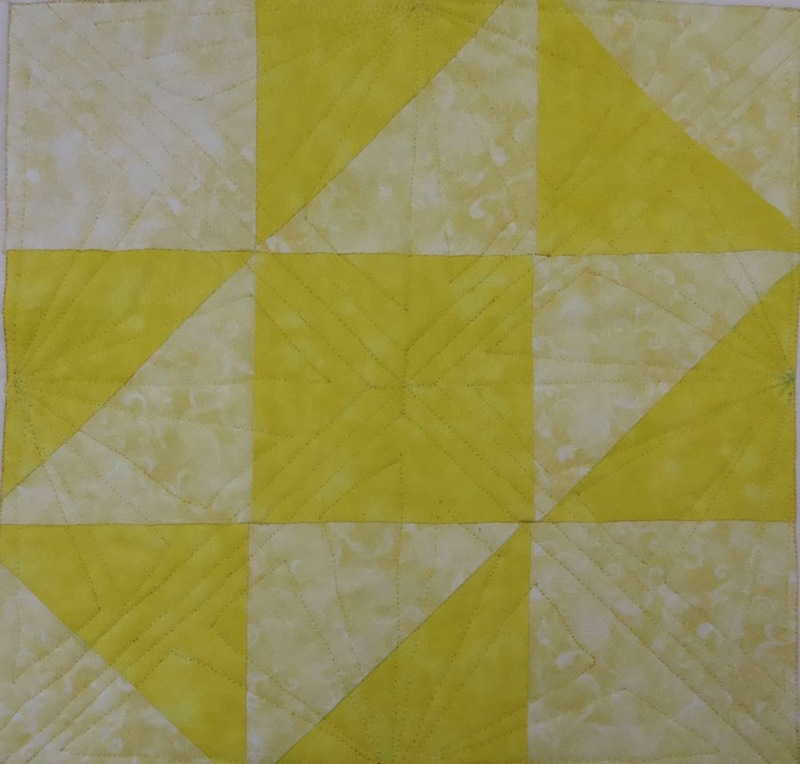 I've been able to use the three main patterns and many of the variations on these blocks. It's coming along very well. 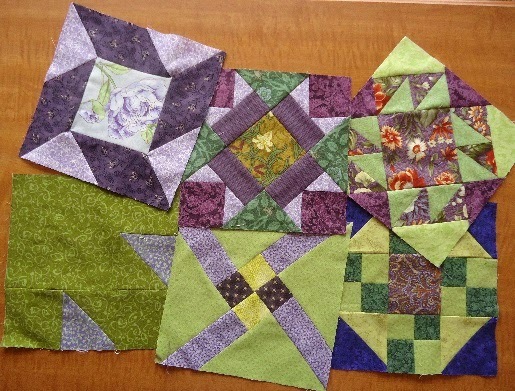 Here are some of the quilted blocks. First quilted block without marking - Yikes! This gold block to the left was the first one that I quilted after spending about 30 minutes practicing. It's pretty awful if you consider that most of those lines are supposed to be straight! After that block, I've been marking all of the others before quilting them. Since they are all straight lines that can be done with a ruler, it's really not that time consuming. For the result, I think that it's well worth the time spent. Here are the 3 marked blocks that I'll be quilting soon. I've been able to mark all of these squares with a pen that disappears when you iron the fabric. 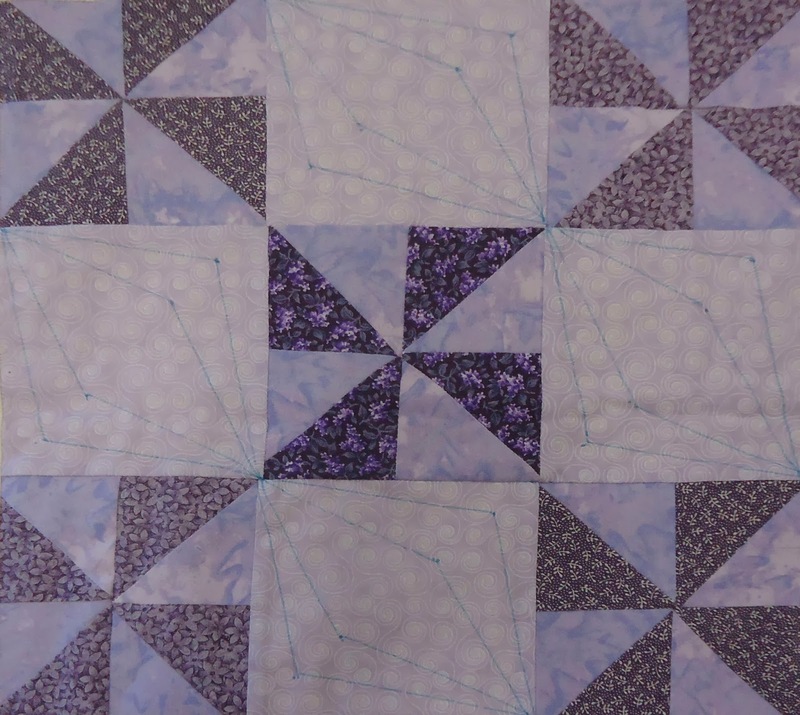 I didn't bother marking all of the lilac square since I'll just be following the lines of the windmill design . I will probably be marking these for a while. Of course the more I practice, the better I'll get. Marking is really not that time consuming since it's only with a ruler and not a template. Marking also lets me figure out what I want to quilt. If I don't like it, I just iron the marking off! It's also helping me get better at quilting on the line. It's more difficult than you might think!